Apparently there’s a documentary titled "Marketing the Mustang: An American Icon." on the Mad Men Season 4 DVDbox-set extras. 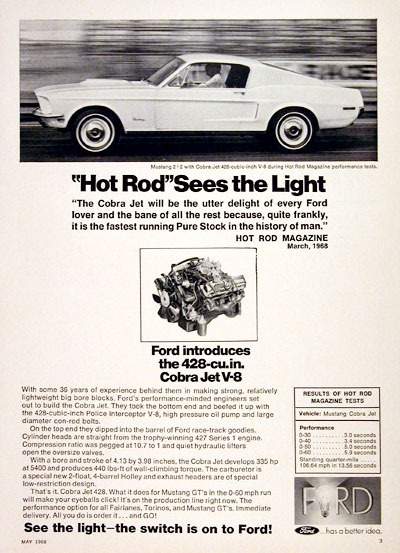 It tells how Ford executive Lee Iacocca persuaded a very reluctant Henry Ford to build the Mustang by citing research his agency guys gave him about the target demo (newly affluent boomers), and lays out the groundbreaking marketing of what would become an instant automotive classic. Thanks for the heads up Steven. 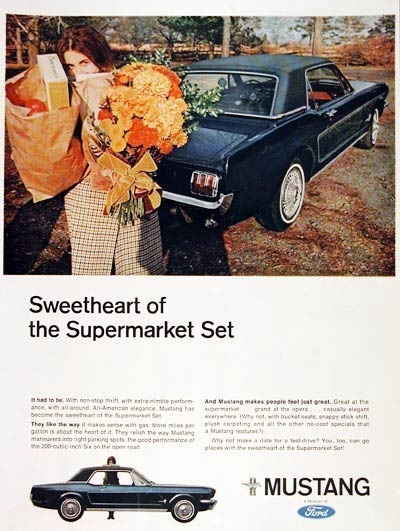 This entry belongs to the 3rd edition of the AdClassix special we’re organizing here this week – all in honor of some great classic Mustang ads. You can find the full collection here at the end of the week. In line with yesterday’s AdClassix post about the Shelby Cobra GT’s, here are two more specific ones…The road cars. This one’s a variation of an ad I posted long time ago (December 2008 to be exact) promoting the Shelby Cobra GT 350/500.